TRIPPER: Suze Yalof Schwartz is the founder of Unplug meditation. Before moving to Los Angeles, Suze was a fashion editor and stylist in New York for Vogue, Elle, Marie Claire and Glamour. (Where she was an editor for 14 years!) You may have seen one of her many appearances on the Today Show. Suze had an aha moment in late 2012,when she wanted to learn how to meditate and couldn’t find a place that fit her schedule, budget or aesthetic. So she decided to build it herself! One second a fashion editor, the next a Spiritual entrepreneur! Who doesn’t need to take a break from their busy schedules? We all need to unplug—here’s Suze’s favorite day in her new hometown. It’s tough to start practicing on your own, and if you’re not lucky enough to live close to Unplug, why not try a guided meditation online. Oprah Winfrey and Deepak Chopra have teamed up for the 21-Day Meditation Experience, you register for the next upcoming free experience, but if you can’t wait you can also buy previous meditations immediately. Or how about a meditation app—Headspace, Calm, and Simply Being are some of our favorites. Check out the recent article about Suze and Unplug in the NY Times. Feeling enlightened? Head to Café Gratitude in nearby Venice Beach where you order your salad by names such as Humble, Transformed, Bountiful, and Awesome to name a few. Mindful eating at it’s best and most delicious. Wake Up: When we were out house hunting we’d stay at Shutters. Sometimes you can get a good star sighting - it’s a nice way to start the day. Head downstairs for the most divine breakfast. Be sure to sit on the patio. Stroll: Grab a complimentary coffee from the lobby and take a walk on the beach. Wander over towards the Pier or walk out to the ocean for a toe dip. Meditate: No surprise here, head to Unplug and drop in for the 9:30 guided meditation. All you need to do is sit back and relax for 30 minutes – Unplug’s mission is to be your remedy – what could be better? “Once can change your day, and more can change your life”! Shop: Stop by Bristol Farms and take a peek at LA’s most luxurious grocery store. While you're there, create your own custom juice. Make your way up to the Brentwood Country Mart. I love every store here! Some of my favorites are Calypso Home, Pippa Small Jewellry, and Jenni Kayne. Even the Post Office is chic: how many post offices sell Tretorns and Petite Bateau shirts! 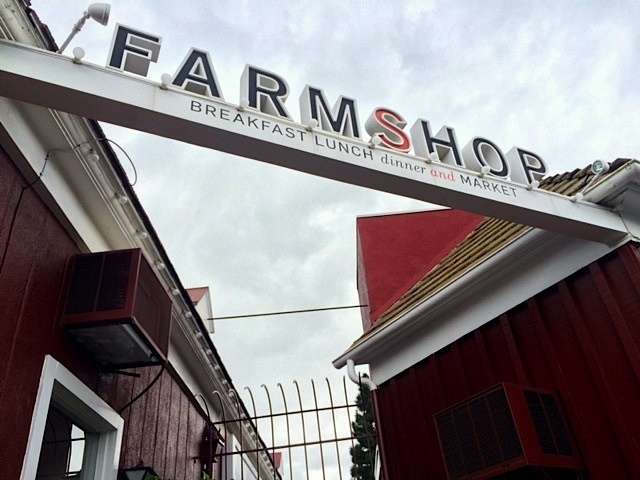 Munch: At the Country Mart, eat at Farm Shop for a great salad. Browse around; it’s a beautiful gourmet food store as well. If you have kids with you, grab a taco or salad and eat in the courtyard. For dessert, taste the best ice cream in Los Angeles at Sweet Rose. This homemade artisan ice cream is by the people behind Huckleberry Café and Rustic Canyon in Santa Monica, both family favorites! I personally love the Mint Chip and Salty Carmel. Pamper: Before dinner, head to Dry Bar on San Vincente. The blow-dries are inexpensive and great. Dinner: I have three favorites on the West Side of LA. Giorgio Baldi has only a few tables so it’s hard to score a reservation, but if you do, you’ll be rewarded with the best Italian food. Katsuya is perfect if you’re in the mood for sushi and a fun atmosphere. Reel Inn is a super casual surf shack. Pick out your fish then the cooks prepare it just the way you want. After Dinner: My “secret” favorite desert spot is a small little shop where I get the best fresh churros-- Churros Caliente. Get the ones with rich chocolate served in an espresso cup.